The deluxe poseable Webcrawler action figure is incredibly well manufactured. There are over 20 points of articulation to ensure that you can pose this figure in hundreds of different positions - although, for some strange reason, there are no joints in the knees. This figure also comes equipped with a removable raincoat which has some incredible detailing on it. But it's not just the coat that is well manufactured, this is an extremely well detailed figure which will provide hours of fun for the younger generation, who will want to play with it, or take pride of place on the mantelpiece, for any collector that just wants an ornament. The likeness of this toy to the character of the film is fairly accurate too - something that is becoming more and more of an issue as these collectable figures are starting to find a home amongst serious enthusiasts. 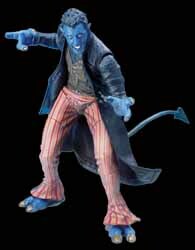 The Nightcrawler action figure is almost guaranteed to appease both serious collector's of movie memorabilia as well as fans of the movies' that just want a cool toy to play with.